Tim Flowers is already a Premier League and League Cup winner, England international and Britain’s most expensive goalkeeper (1993-2001). On Friday, the 51-year-old hopes to add another entry to his impressive CV: FA Cup giant-killer with Solihull Moors. Flowers manages the non-league club aiming to topple 1953 winners Blackpool in the second round in front of the BBC Two cameras at Damson Park, a former golf driving range one mile from Birmingham Airport. Four seasons ago the West Midlands side, formed in 2007 by the merger of Solihull Borough and Moor Green, struggled to attract crowds of 500. Against League One Blackpool, a club record 3,000-plus attendance is expected as the National League club look to reach the third round for the first time – and join the likes of 13-time winners Arsenal and holders Chelsea in Monday’s draw. 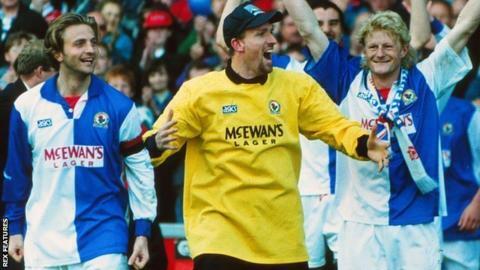 Flowers won the Premier League with Kenny Dalglish’s Blackburn Rovers in 1995, but told BBC Sport: “I haven’t looked at my title medal for about 10 years. Solihull were bottom of English football’s fifth tier, six points from safety, when Mark Yates and then assistant Flowers arrived 12 months ago. A 10-match unbeaten run secured a third successive season in non-league’s top flight and led to Yates accepting an offer to become manager of League Two newcomers Macclesfield Town in the summer. While Yates left Macclesfield after just 12 league games, Solihull have gone from strength to strength since promoting Flowers, despite one of the smallest budgets in the National League. “At the start of the season our aim was not to go down,” said Flowers, whose team are classed as full-time and train on Mondays, Tuesdays and Thursdays. Fast forward four months and new targets are being set at a club located close to the town’s huge Jaguar Land Rover plant. Flowers’ side are sixth, seven points off automatic promotion to League Two, with 12 wins from 21 games. “We’re way ahead of where we thought we’d be,” he said. “For us, finishing mid-table would be like winning the league. Flowers enjoyed a stellar playing career, which included 11 appearances for England. He was part of the squads at both Euro ’96 and the 1998 World Cup but did not play in either. At that point he was Britain’s most expensive goalkeeper, having joined Blackburn from Southampton for £2.4m in 1993. It was only when Richard Wright was signed by Arsenal for £6m eight years later that Flowers lost that distinction. In addition to winning the Premier League, he also helped Leicester City win the League Cup in 2000. Since retiring as a player, Flowers has coached at Leicester, Manchester City, Northampton, Nottingham Forest and Fulham, and held assistant manager roles at Coventry City, his boyhood heroes, QPR, and Hull City. But he is relishing life where money is tight, training pitches are often flooded, and overnight stays are considered a luxury. On 17 November, Solihull had a 12:30 kick-off at Braintree – 150 miles away. Instead of heading to Essex the night before, Flowers’ team set off at 8am and had breakfast on the coach. They won 3-0. “Sometimes the quality of pasta you get at a big club is better than you get here,” added Flowers, who had to overcome rejection before getting another break in management after a stint in charge of Stafford Rangers lasted just 11 games. As well as Dalglish, Flowers also played at Blackburn under Roy Hodgson, who turns 72 next August and is in charge of Crystal Palace. Solihull’s squad includes forward Kwame Thomas, who played in the Championship for Derby County, and in the FA Cup for Blackpool in 2015. Defender Jamie Reckord has played in League One for Scunthorpe, Coventry, Swindon and Oldham, while Harry Flowers – no relation to Tim – is the grandson of World Cup winner Ron. Their most experienced player, however, is midfielder Darren Carter – veteran of 52 Premier League appearances for Birmingham City and West Bromwich Albion. At 18, Solihull-born Carter wrote his name in Birmingham folklore when he scored the winning penalty against Norwich in May 2002 to send the Blues into the Premier League. Sixteen years on, two weeks short of his 35th birthday, Carter is subjecting his body to the demanding world of non-league. He enjoys it so much he intends to carry on playing for a “few more years” and has taken up yoga to help prolong his career. Having missed just two league games since joining his hometown club in June 2017, it appears to be having the desired effect. “I want to keep playing until my body tells me I can’t,” said the club captain. Carter has come a long way since he faced an 18-year-old Cristiano Ronaldo after being picked to play for England against Portugal at the 2003 Toulon Tournament. As well as Birmingham and West Brom, his career has taken him to Sunderland, Preston, Millwall, Cheltenham, Northampton and Forest Green Rovers. When Adi Yussuf is not on the pitch, Solihull’s nine-goal leading scorer is busy trying to improve the lives of orphans in his native Tanzania. Born on Zanzibar in the Indian Ocean, Yussuf has recently launched a foundation to help feed, clothe and educate youngsters there. “The idea came after I went back on holiday recently. There were kids on the streets – they don’t know when they are going to eat or where they are going to sleep,” said the 26-year-old former Leicester City youth player, who has scored in both of Solihull’s FA Cup ties this season. Yussuf is raising funds to build a school after spending about £10,000 buying land in Zanzibar. “I came to England when I was very young. I could have been one of those kids if I had still been living there,” added the former Burton Albion and Mansfield player, who joined Solihull last January.